What path would you choose? The dreamer or the realist? The cool or the geek? Two former roommates try to answer that question themselves when their paths collide after college. Jake is still chasing the elusive rock star dream. MC is the lonely owner of a successful night club. MC has always had a thing for Jake's girlfriend, Lily. Could tonight be the night he finally has a chance? It's a story fit for an opera, told against the backdrop of a battle of the bands competition, and featuring a straight-up rock score based on the music of actual opera arias. >This is a fully staged workshop with a live band and a talk back session. A "workshop" is when a new play progresses from its first revisions after a "reading". The workshop includes opportunity for audience members to complete a response form after the show, to help the writers refine the play and prepare it for final copy. KEVIN BARLOWSKI (MC) Playhouse on Park: MAMA D's OUTRAGEOUS ROMP (Emcee), SWINGING ON A STAR (Man 2), COMPANY (Peter), YOU'RE A GOOD MAN, CHARLIE BROWN(Linus), I THINK I CAN (Peter), THAT HOLIDAY FEELING (Featured Soloist), IF YOU GIVE A MOUSE A COOKIE (Boy). 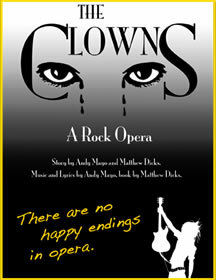 Kevin is thrilled to revisit THE CLOWNS, having played MC in the staged reading last year. He has also directed Playhouse on Park's children's musicals BUNNICULA and MISS NELSON IS MISSING and musically directed ALL I REALLY...KINDERGARTEN. Education: Emerson College (Theatre Education)and Circle in the Square Theatre School (Musical Theatre). Kevin is a Theatre Arts Instructor at Hall High School and a core faculty member at the Greater Hartford Academy of the Arts where he teaches in the Theatre and Musical Theatre departments. Unending love and thanks to my parents, ShareBear, Andy, Matt and Sean. MACKENZIE FRIEDMANN (Lily) Playhouse on Park: MAMA D'S OUTRAGEOUS ROMP, SWINGING ON A STAR. Currently pursuing her BFA in Musical Theater at The Hartt School, credits include: BOOK OF DAYS, NINE (Assistant to the Choreographer). Graduate of The Greater Hartford Academy of the Arts, Musical Theater Major, credits include: ANYTHING GOES, SWEENEY TODD, URINETOWN, CABARET, DESSA ROSE. Recently took part in a reading of a new musical, BURKE & HARE, at Little Theatre of Manchester in Cheney Hall. PAUL LUCENTI (Xavi) Paul is excited to be making his Playhouse on Park debut with "The Clowns". He has been actively acting around New England since he graduated High School in 2006. Favorite roles include, Roger (RENT), Troy (HIGH SCHOOL MUSICAL, Ren (FOOTLOOSE), Judas (JESUS CHRIST SUPERSTAR), and Frank N' Furter (THE ROCKY HORROR SHOW). He recently completed writing a musical with his brother which he hopes to produce on stage. He like to thank Sean Harris, Andy Mayo, and Mathew Dicks, for the opportunity to be a part of such a great production. He would also like to thank his incredibly talented cast and crew for tolerating him this past week and as always his family and friends for all their support.